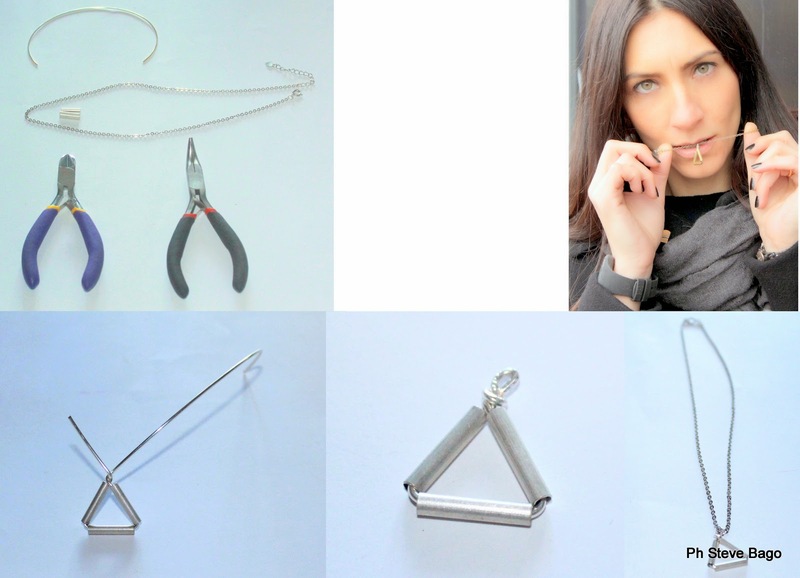 The Mora Smoothie fashion blog, DIY fashion by Paola Buonacara: My new fashion DIY Pyramid necklace! My new fashion DIY Pyramid necklace! How are you? Today I'm gonna post u the fashion DIY necklace you saw here. Come state? Oggi vi posto il fashion DIY della collana che avete visto qui. It's a lit bit of time that are cool jewelry with geometric shapes, and I had been so long that I wanted to create the pyramid and then one day making some creations my eyes light up finding the silver chopsticks and so I created this necklace or better this pendant. Time: 5 min, but perhaps even much less. Essential: chain and closure, silver wire, 3 silver chopsticks and pliers. Tutorial: I put the 3 silver chopsticks in the silver thread, I created a triangle and then with the pliers I closed everythings creating a circle to thread the chain. Da un pò di tempo vanno di moda i gioielli con le forme geometriche, ed io era da tanto che volevo la piramide e poi un giorno presa da altre creazioni mi si illuminano gli occhi trovando le bacchette in argento e così eccomi a creare questa collana o meglio questo ciondolo. Tempo: 5 min, ma forse anche molto meno. Necessario: catena e chiusura, filo argento, 3 bacchette argento e pinze. Tutorial: Ho infilato le tre bacchette nel filo argento, ho creato il triangolo e poi con le pinze ho chiuso il tutto creando un cerchio per infilare la catenina. Etichette: DIY, diy necklace, fashionblog, fashionblogger, themorasmoothie. You very talented doll love this DIY. Ciao, sembra facilissimo e il risultato è molto carino!! Sei un piccolo genio...risultato finale bellissimo...Voglio proprio provarci, si possono creare tante forme con questa tecnica!!! love selfmade thing-accessoires! u done a great job..
Carinissimo anche questo pezzo, brava Paola! un idea originale, mi piace! Buona Domenica! I'm new follower on bloglovin :) Follow back ? Che carino! Sei davvero brava! And do you mind participating in my giveaway..
You can stand a chance to win a Super Style Cape Coat of your choice..
Just register with the website and Like the page or follow their twitter and give me your email id in the comments.. Looking forward to see your participation. Here is the link to the post..
What a gorgeous idea. The outcome is awesome, girl. Wow super cool diy idea. The necklace looks awesome! this looks awesome thanks for sharing! Another really cool DIY idea :) Thanks for sharing and happy Sunday evening! Adoro le tue opere Paola!!! Ma che bello Paola! Mi piace molto! Belli e interessantissimi i tuoi post. Sembra facile... ma io sono una vera incapace con il craft... che dici, ci provo???? Questa collana ha tutto, finezza e creatività. Fabulous dear! great piece and super easy to make! Its a great idea and look very nice! Thanks for share dear! Beautiful and fashionable necklace. I will be making this soon. thanks for the DIY. I'm feeling blue...with my dress by Tuwe! The New Smart Fortwo & Forfour! The invasion! My new Daniel Wellington watch!! Outfit with my new shoes by SKA! Triumph bloggerday and the Magic Wire! Never say... It's too late! !